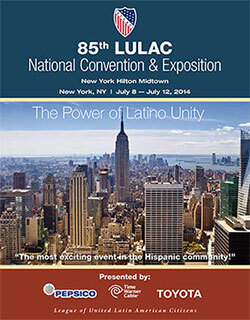 The League of United Latin American Citizens invites you to participate in the 85th Annual LULAC National Convention & Exposition in New York, NY from July 8 through July 12, 2014. As the premier Hispanic convention, the LULAC National Convention draws over 20,000 participants each year including the top leaders from government, business, and the Hispanic community. The LULAC Convention is an exciting, history-making convention, because it convenes the national delegates of LULAC to discuss issues, set policies, and elect the organization’s national leaders. For this reason, the LULAC Convention makes news and is covered by national and local media. It is the only convention in which participants representing Hispanic communities from across the country determine the positions and strategies of a national Hispanic organization. The LULAC Convention is also well attended by major corporations who recognize the importance of reaching out to national Hispanic leaders and influential community members directly. There are opportunities to sponsor workshops and events, to showcase products and recruit Hispanic professionals in the convention exhibit hall. In addition, all proceeds support the dedicated work of LULAC to improve the quality of life for Hispanic Americans. The LULAC Convention hosts the LULAC Federal Training Institute (FTI), an intensive and structured career development program for government and public sector employees. In partnership with the OPM and other Federal agencies, the Federal Training Institute offers workshops and plenary sessions that enable government employees and other employees to enhance their leadership skills and develop the Executive Core Qualifications required for entry to the Senior Executive Service. Read more. Emerging career opportunities, top companies, live interviews. Whether you are an employer looking for top talent or a professional looking for your next job, you will want to attend the LULAC Career Fair. This three day event features great jobs from over 250 top companies and federal agencies that are ready to hire. Your path to a higher education starts at the LULAC College Fair. More than 30 representatives from top notch colleges and universities are anxious to talk with you about postsecondary opportunities at their institutions. The LULAC National Youth Pre-Convention takes place during the three days prior to the LULAC National Convention (from Sunday, July 6, 2014 to Wednesday, July 9, 2014) and is an annual gathering hosted for LULAC Youth by a local university. This year LULAC has partnered with Princeton University. Read more. A four-day event (from Wednesday, July 9, 2014 to Saturday, July 12, 2014) for Hispanic youth. Youth Packages are only available to LULAC members who qualify for this group. Highlights: Convention in NYC City, Workshops and Educational Panel Discussions, Leadership Training, Exposition Hall that includes a free health pavilion, career fair, and college Resource fair, Top-notch Banquet Events Featuring Nationally Recognized Speakers, Federal Career Training Symposium, Dynamic Concert Presenting Top Headliners, National Youth Assembly and Elections. Read more. The Young Adult Conference features four-days of leadership development and policy workshops for college students and young professionals. Read more.